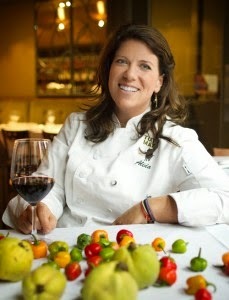 We sat down with chef Alida Solomon from Tutti Matti and dished about life and food. Tell us about cooking with salt. Salt is a huge part of what we do as chefs. Every dish could technically have its own salt. Fish could use Himalayan sea salt mixed with a little fresh orange and lemon zest and chopped rosemary. The recipe below is a Tutti Matti favourite. Take raw tuna or a fatty white fish like European bass. You can even use a whole fish. Mix 2 cups of Himalayan sea salt with zest from 2 lemons and 2 oranges, 2 tablespoons of fresh chopped rosemary and 2 egg whites. Beat the egg whites and fold in the salt mixture. In a nonstick pan, put down half of the salt mixture (will have a clay-like texture), then the fish and bury the fish with the other half of the salt mixture. Bake at 350 for 20 min. Once it's baked, remove the salt mixture from the fish and serve with good extra virgin olive oil and a glass of Vermentino! What is your career? What do you love most about it? I am chef and restaurateur of Tutti Matti. I love the instant gratification of creating in the kitchen. How do you stay balanced with life, career, family, friends & health? My life as a chef will never be balanced as I am currently working on a new location in Italy, but I would never change a thing. My family and friends love the stories and the meals. Being a chef is not a job, it’s a career life style. It’s your everything. We don’t feed, we eat. I went to the waters for the first time many years ago at the end of the summer and had the works. I walked out of the treatment room and went to one of the red chairs and stared at the ceiling for, what felt like, an eternity. I used to go once a month on Sundays but now I prefer a Monday when it's not as crazy. If you could, what advice would you give yourself 10 years ago? 5 years ago? 20 years ago? Know what you want and remember who you are and why you chose this. Never lose the passion to live this life. The moment you feel like it’s too much, take a moment, step back and find the passion again. Never stop traveling to learn more about what you do. Never stop reading and eating. Night owl. I give the owls something to talk about. Three adjectives to describe yourself? Who is your role model or mentor. Female chefs who choose this crazy life. Aspiring women who live their passions.